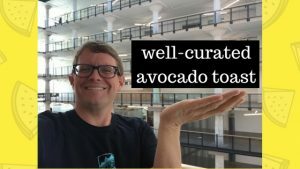 A page about well-curated avocado toast can be found here. You will not find photos of avocado toast on this page. Instead you are getting a warning. Once you start buying domain names, it can lead to more domain names. For example, I was watching the interview portion of this news article on the Cambridge Analytica Whistleblower. He mentioned Facebook cut him off of from viewing “well-curated avocado toast” on Instagram. I just had to check if the domain was available on my favorite domain name purchasing site.